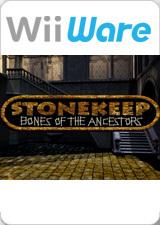 Stonekeep: Bones of the Ancestors: Stonekeep. The legendary city was once ruined by a dark god’s magick, but saved by your ancestors. Now the legend of Stonekeep requires a new hero: You. Explore dungeons, watch out for deadly traps, fight monsters with a variety of weapons or control dangerous magicks. The choice is yours. But all is not lost. There are allies within the halls of Stonekeep. Choose one to help lead you to victory. The graph below charts the compatibility with Stonekeep: Bones of the Ancestors since Dolphin's 2.0 release, listing revisions only where a compatibility change occurred. This page was last edited on 23 January 2018, at 05:24.